Ruthie is my newest classroom machine. She’s certainly a sturdy girl – a Riccar Model 707, which I was told by the company dates her to the late 1970’s. Like her namesake (my mother), she has a few quirks – she won’t make any stitch past number 9 on the stitch selector wheel and the service tech couldn’t figure out why. Not to worry, because what stitches she does do are absolutely beautiful and the machine is a breeze to operate. Fortunately, Ruthie had recently been serviced when my friend gifted her to me. She was originally housed in a cabinet, so she needed a carrying case, power cord and machine feet. The case you see here is the super deluxe flatbed model with the extension arm advertised on some websites. Fortunately, I found one locally. It is a well-made case and worth every penny – especially if you have an old Singer flatbed or Class 15 clone that you want to make portable. Ruthie sounded like a Mack truck when I first tested her out on the kitchen table. The carry case, along with a foam pad and thick toweling in the case underneath the machine helped muffle the noise. Accessories did not come with the machine. Fortunately, I have many class 15 bobbins in my stash and old sewing machine feet that will work quite nicely on Lil Ruthie. I discussed the foot/power cord situation in an earlier post. Honestly, I’d never seen such a thing before. Instead of a single port that encompasses the power and foot pedal, Ruthie has two cords that must be plugged into a “block”, which is in turn plugged into a standard electric outlet. Hubby lengthened the foot pedal cord for me and proceeded to install a more substantial “block” for the light and motor cords to plug into. That’s what you see here. 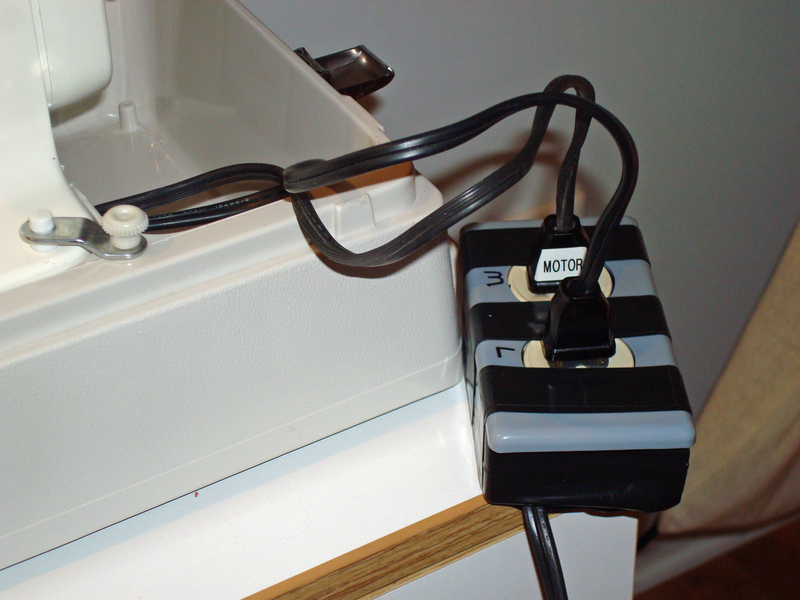 The two cords from the machine plug into the gray box pictured. Attached to the gray box are the power cord and the foot pedal. The wiring is actually 16-2 lamp wire. The light will stay on all the time (if you push the button on the machine) and the machine only sews when you press the pedal. Should you reverse the cords, the machine will run continuously (if the light switch is on) and the light will only come on when you press the foot pedal. That’s why I marked them M and L and you see labels on the plugs. The box will get blinged and it nestles out of the way in the side compartment. Thanks to hubby, I have a sturdy electrical connection with no worries about wires coming loose from student use. Update 1/10/16: Ruthie was recently “rehomed” to someone in need of a machine. 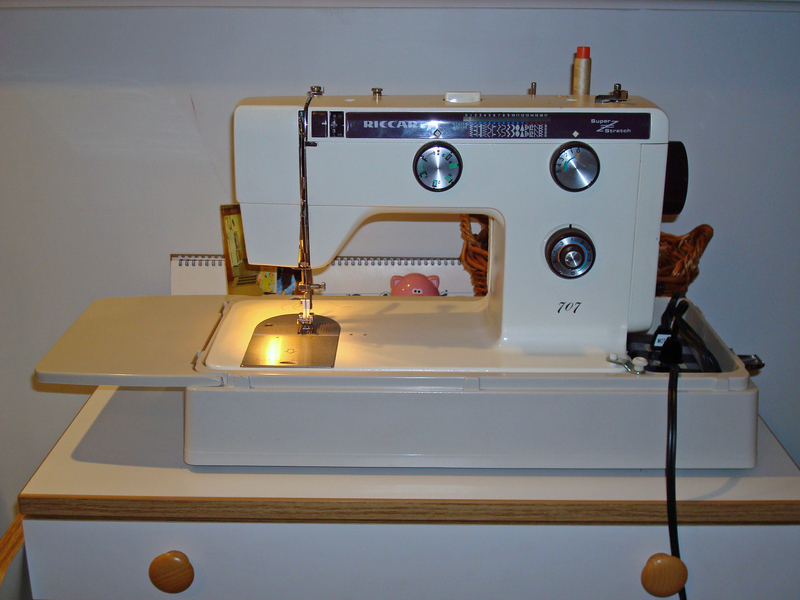 Nice machine, but way too heavy to tote to sewing classes, especially when no one wanted to use it.